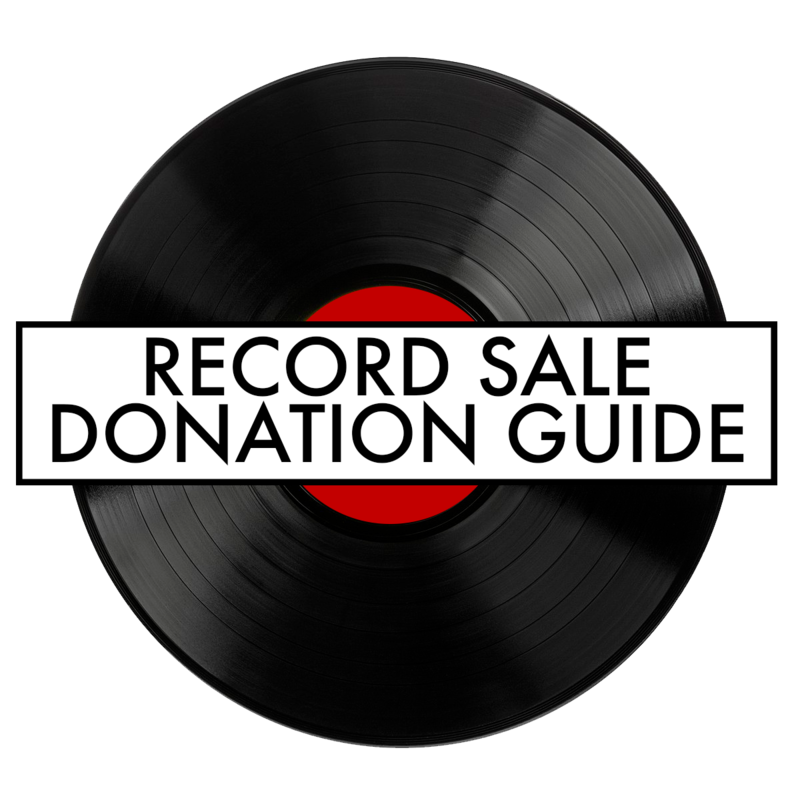 Spokane Public Radio is now accepting donations for the annual KPBX Record Sale next February. Drop off your items at 4000 Holes, 1610 N Monroe St. in Spokane, Monday - Saturday 11-6. We kickedoff collection season with Fall Donation Day on Saturday, September 22, 2018, but you can continue to bring your gently used equipment and media down to 4000 Holes at 1610 N Monroe St in Spokane. We'll also have another Donation Day event at SPR on February 9 in preparation for the Record Sale February 23 and 24 at the Spokane Valley Event Center. 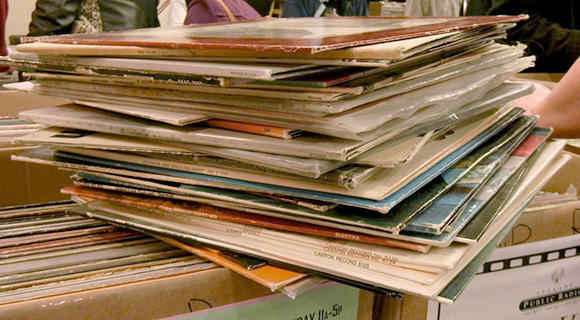 A stack of records at the Record Sale. LPs, 45s, Compact Discs, DVDs, Blu-Ray, other recordings and equipment are all accepted at Spokane Public Radio until early February. We accept equipment, vinyl records, 78 RPM records, 45 RPM singles, compact discs, DVD and Blu-ray discs, cassette tape, eight-track cartridges, reel-to-reel tapes, commercial VHS and Beta tapes, and sealed blank tapes. See details below. We CANNOT accept home-recorded cassette tapes or CD-R recordings due to copyright issues. In general, all items should be clean, in their original sleeves or cases, with all booklets included. The primary reason for the sale and the reason it has gone on so long. Records should be in their original jackets with dust sleeves and in ‘gently used’ condition. In the case of long works such as operas or long symphonies, be sure that all records are in the case along with the books. What we won’t need: Reader’s Digest, Time/Life, Longines, or Columbia House sets. We take a limited number of these as there are a lot of folks who come out to find historic music that has never been re-released from this format. Be sure all the records are in their ‘albums’ and pack them carefully to insure they make it to our sorting center. The single record that introduced a lot of songs. We’ll take them from any source and in any form; if they have the original picture sleeves, so much the better. Modern convenience for long play of music. We ask that CDS come in protected in some manner, preferably in their jewel cases, with their books and tray notes. In the case of the CD Box Set, make sure all CDS in the set as well as the books are enclosed as well. In the case of TV series or multi-part works be sure all parts are enclosed and again ‘gently used’ is a guide to a good used DVD/Blu-ray. This hardy format rolls on despite all the upgrading. So, be sure the cassette comes in its case or in the case of a box set or a long classical work such as an opera, with all the tapes and the books that should be with the set. We’ll take them in whatever manner that they come in as. In sleeves will be so much better. Please be sure that these come in with a box as well as books (if classical or longer pop works), wound on the proper reels in a ‘played’ condition. Please be sure all are in their sleeves and complete with anything extra. Also be sure ALL tapes for movies are in the box or sleeve as well. We will take blank reel-to-reel tape as it is a scarce item and is popular with many of our sale goers. However, these will be bulk erased to insure that no content of a sensitive nature will be heard. If you have SEALED unused cassette tape, VHS tape or even CD blanks, these will be gladly accepted for the sale in limited numbers. We love the classic equipment, as long as it's in working condition. Please test your equipment before bringing it in. Items should include manuals and accessories. Should you desire to help out as a volunteer (or have you ever wondered what it’s like to work the actual sale) please call Stephanie Ingoldby, our Volunteer Coordinator (same numbers) and sign up. She’ll be glad to have you come aboard. Besides, it’s a fun opportunity to meet a lot of music lovers as well. Above all, please know that we cannot do this sale without you. From bringing in your donations, to working the sale, to promoting it to your friends, it’s all done for you and by you and we thank you as listeners and supporters of Spokane Public Radio for making it happen. See you at the sale!